Harley Davidson Fat Boy offers a perfect mix of Classic style, comfort riding and strong engine. The motorcycle justifies to company’s prestige in motorcycle making, it features with Twin Cam 103 engine which is able to produce power of 97.4 ft-lb at 3000 rpm. Power of bike is controlled under 6 Speed Cruise Drive Transmission. Triumph Thunderbird Strom is the biggest rival for the Harley Davidson fat boy as the bike is oversized in every aspect from dimension to engine capacity. It features with 1699 CC Engine which offers a maximum torque of 15.9 KGM at 2950 RPM. It comes with six speed transmission system. Average Rating – If we talk about the comfort and styling of the fat boy then, it comes with Full Length Rider Footboards that giver extra comfort and handling to brakes and gear shifts. Seating of the bike is low heighted with lowdown frame and rigid power train which will give solid and comfortable connection to the bike and road. Triumph Thunderbird is somewhat similar to Fat Boy in seating with wider and low height seat but unwelcomed the pillion rider with miniscule rear perch. High handle bar and Cruiser-typical forward –set foot pegs make it better choice for taller guys. 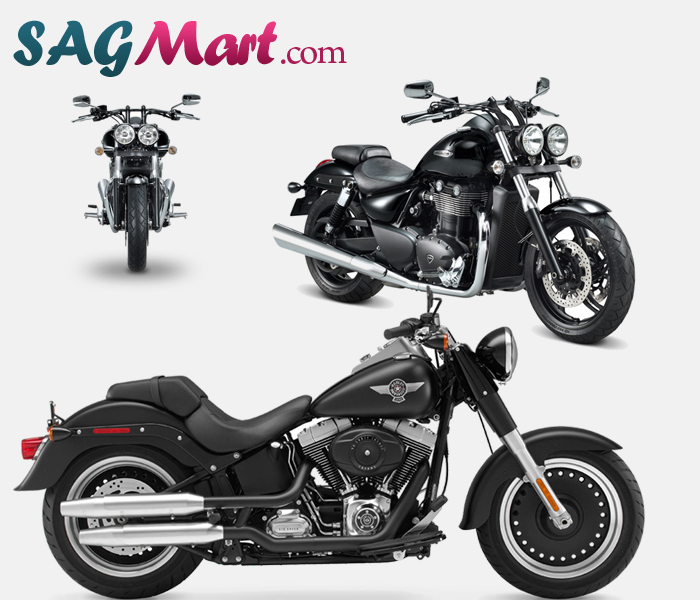 Market Value – Both these bikes are good competition for each other and also face some competition from other customized bike manufacturers. In India Fat Boy is available in three colours and worth around 13,50,000 INR (Ex Showroom) which is considered to be really big amount for Indian Riders but totally worth due to company’s name and bike’s efficiency. Triumph Thunderbird Strom is available for Indian riders in two colours which will cost around 13,00,000 INR (Ex-Showroom). As company does not have too many customers in country and also lacks number of showrooms around the nation, 13 Lakh is a big amount for the bike. Value for Money – Brand’s iconic name and its glorious history in bike making, makes Fat Boy total worth for Money. The leather tank strap, satin chrome side badges and satin chrome speedometer and ignition switch console make it more eye catching. The sensation of riding such a heavy torque machine, makes it purely addictive and hard to resist to have one. Front two head Lamp style gives classic look to Thunder bird storm. Liquid cooled and fuel injected parallel twin engine make it powerful. If we talk about the ride of bike in city and highway then the bike gives efficient and good control on highway with wider tyres and greater handling but on the other hand, large turning radius and wider look make it tough to ride in crawling city traffic. This bike is not preferable for daily city ride. Advance options – Fat Boy is provided with latest technical specifications and advance options such as Anti-Lock Braking system, Digital Speedometer, greater front and rear suspension. Bike also features advance security system which arms and disarms bike’s electronic security automatically as rider approach and moves away from the bike. If we talk about the advance options of Thunderbird Strom then it features with some of the finest aspects. Anti-Lock braking system gives efficient and powerful braking. Front telescopic suspension forks and rear shock absorbers take care of suspension system. Greater security system, digital speedometer and LED front and rear lamps are some other features. Verdict – Fat Boy is the bike for premium riders as bike cost around 14 Lakhs makes it premium and luxury piece stood away from budget buyers. Impressive power and stunning features make it total worth to its money. People who like long bike rides and want to stand apart from crowd should buy this one. Harley’s name makes it cheery over the cake. Triumph Thunderbird Strom is expensive bike intended to attract the premium bike lovers. Bike is designed for long cruising and highway ride. People who are willing to buy this for city and daily purpose use, are advice that they should look for other option as it is not for daily and city‘s crawling traffic.